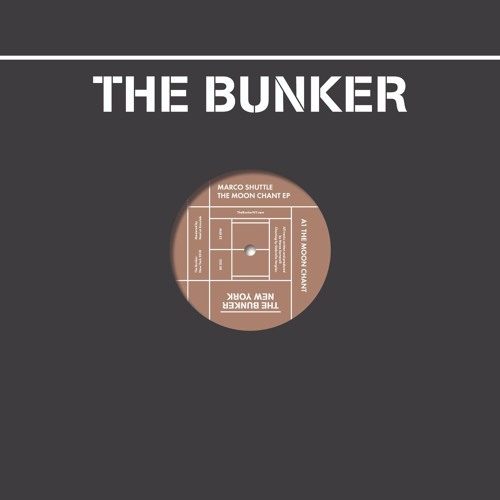 Available for pre-order on our bandcamp: https://thebunkerny.bandcamp.com/album/the-moon-chant-ep-the-bunker-new-york-035 @marco_shuttle first caught our ear many years ago when we discovered his music the old fashioned way, picking up his Clone Store Only Series record at Halcyon in Brooklyn. This mysterious record led to becoming obsessed with his incredible, self-released podcasts that were floating around online at the time so we reached out to him and ended up working together to put his Fanfara EP out on our label in 2014, when he was almost unknown in North America. Since then, his music career has grown in leaps and bounds. He’s no longer at his day job in the fashion industry but tours and produces full-time, releasing albums on his own Eerie Records, Donato Dozzy and Neel’s Spazio Disponibile, as well as a string of killer EPs on several respected imprints. His productions and DJ skills have led to repeat bookings at Labyrinth Festival, Berghain, Concrete, Fabric, De School and just about everywhere else around the world where discerning heads congregate to hear great techno. When Marco was in Brooklyn to play an 8 hour set at The Bunker Limited earlier this year he played some new demos that stuck out as something exceptional, even by his very high standards, and we knew we had his next record on The Bunker New York ready to go. We’re psyched to present these intricate and detailed jams for your enjoyment in foggy dance floor corners. These tracks all have that unmistakable Marco Shuttle vibe with plenty of deliberate, slightly twisting melodies, shadowy disembodied echoing vocals that let your brain fill in the meaning, underpinned with punches of tautly layered rhythms. Good EP once again !! Son des années 90 remis au goût du jour, excellent !! ohhh, that vocal! @marco_shuttle excellent track!